As we go to press the ‘Aotearoa is not Sale’ Hikoi has left Auckland and will reach parliament on May 4. Two days later, thousands are expected to turn out at a Christchurch protest calling for mid-term elections and the resignation of the City Council CEO. These events follow after demonstrations against state housing demolition in Glen Innes, a significant labour struggle at the ports of Auckland (see page 7) and protests demanding the reinstating of a rail link in Gisborne (see page 9). 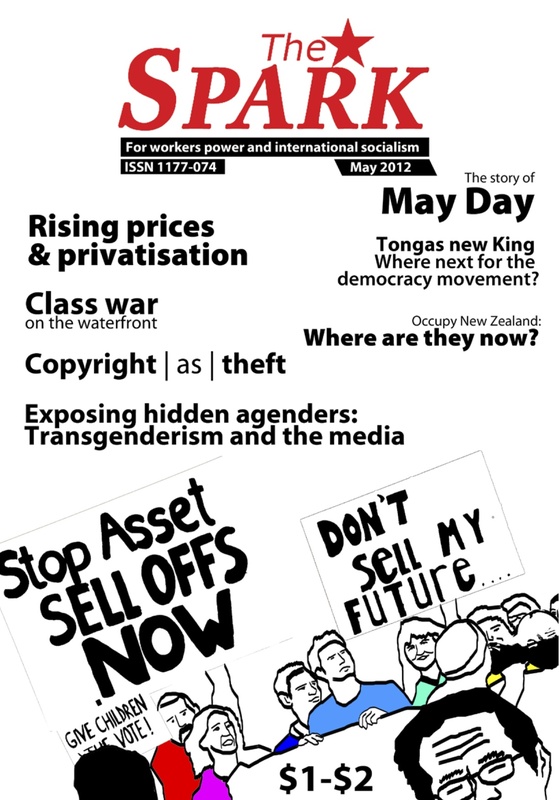 In this issue we cover the Mana Movement AGM and catch up with the various Occupy New Zealand groups to find out what they are doing now that the campsites are gone. Many people who were radicalised by the Occupy movement are involved in the aforementioned mentioned protests. It seems to be the case that ‘You can’t evict an idea’. An article in our previous issue looking at why women have left the Occupy movement attracted a number of responses that are printed on page 11. Elsewhere in this issue you’ll find articles looking at copyright, transgender oppression, and the privatisation of electricity. We also reprint at article looking at the history of international workers day – May 1st.